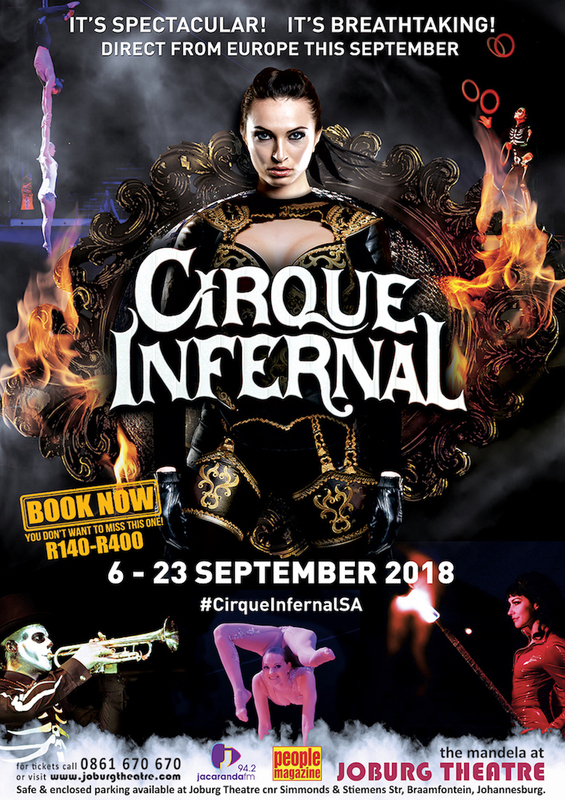 Joburg Theatre is proud to present Cirque Infernal, direct from Europe, on the Mandela stage from September 6th to September 23rd 2018. Inspired by Frederico Fellini, Wim Wenders and Tim Burton, Cirque Infernal offers non-stop captivating entertainment with astonishing and death defying acts. Cirque Infernal was created by Danny Varanne – Danny was part of Le Grand Cirque Adrenaline which was presented at Joburg Theatre in 2012. He headlined the motorbike act; The Globe of Death, which left the audience in awe as they watched three bikers ride inside a globe of steel at speeds of up to 65km/h, all the while trying to avoid collision! Born and raised in a traditional family of performers, Danny started as a showman in his parent’s burlesque theatre in France from an early age. Along with his brothers, Danny started a motorcycle daredevil show. They toured the world and became internationally acclaimed for their skills. In 2012, Danny received two awards at the prestigious Festival International Du Cirque De Monte-Carlo, and an official Guinness World Record! Trapeze artists Celeste Bliss (USA) and François Colarusso (France/Canada). Wilson Stey (France) is the funambulist (tightrope walking). At only 23 years old, Stey is originally from Germany. His ancestors have been walking the tightrope since the Middle Ages. Pro Sufi dancer Aurelia Baque is a native of Toulouse, France. She spent half a year in an Indian Ashram, learning and practising the daily the art of Sufi dancing. The (almost) fully tattooed Stephane Bucheton from France is a former FMX Biker. Tired of crashing, he befriended the Infernal Varanne Riders who taught him to ride the wall of death. Italian Bruno Alliot always said that he would rather ride a bike than walk! If he could, he would ride through the intricacies of life. Alliot, whose father was also a wall of death biker, grew up with Danny’s family. Married on stage and in life, Scottish couple Rachel and Charlie Atlas push the boundaries of the knife throwing act. The beautiful Irina Naumenko studied contortion and other art forms at the world famous Circus School of Moscow. She participated in the Monte Carlo circus festival and toured the world with Cirque du Soleil. Romanian brothers Valentin and Catalin Badea are the Strong Men of the show. Johann Jacob Gorius is the rolla bolla (an acrobat performing on rolling cylinders). He is an Amish native of Alsace in France and his family worked in various circuses in California. French fire performer, Varanella, is the Queen of Darkness in the show. Though you won’t see him live, French actor Warren Zavatta is the Voice of Death in the show. 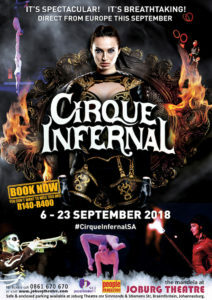 Cirque Infernal is on The Mandela Stage at Joburg Theatre from September 6th to September 23rd, 2018. Performances are Thursdays and Fridays at 8pm, Saturdays at 3pm & 8pm and Sundays at 3pm. Ticket prices range from R190 – R450. Bookings are through www.joburgtheatre.com or by calling 0861 760 670, or via Webtickets. Discounts are available for students, pensioners and groups of ten or more – these are available by calling the theatre directly on 011 877 6853. There’s an age restriction of No Under 5’s.